This chart demonstrates how badly California college students are being ripped off. 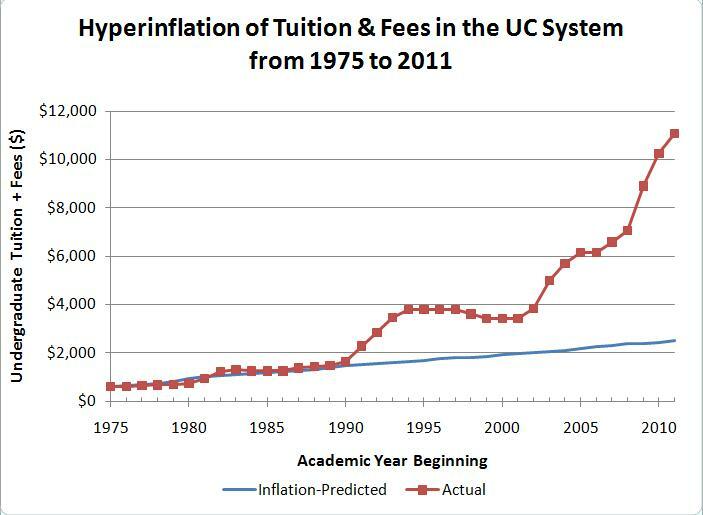 The red line shows the actual average undergraduate tuition + fees across University of California campuses, from 1975/76 to 2011/12. The ratio of the height of the two lines gives the rip-off index — or how much tuition and fees hyperinflated relative to general cost of living — for a given year. For 2011/12, the ripoff index is obtained by dividing actual tuition + fees ($11,064) by what would be expected by inflation alone ($2,506), giving 4.41. A simple way to interpret this is as follows: after adjusting for inflation, the financial burden on students and their families to pay tuition and fees at UC is 4.41 times greater than in 1975!